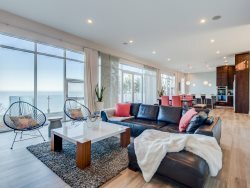 You can’t ask for more at this fantastic beachfront condo development. The Harbours boasts a beautiful swimming pool and private beach. Some condos have views, decks, etc. Check the amenities listing and photos for specific condo information. The Harbours only allows full week rentals. Bedroom 1: Middle Level. 2 Twin. Bedroom 2. Upper Level. Master Suite. Queen. Dawn is very helpful and friendly. I have always found your team to be professional, yet welcoming at the same time. Your team has always been very professional and attentive to any needs that arise. Another well maintained property to help us enjoy our stay in South Haven. All staff members are always helpful, friendly, and knowledgeable. Love staying at Harbours. Beautiful location, the grounds are beautifully kept and enjoy meeting the other guest. Great spot for sunsets and close to the beach. Just wish we could get in one of the units away from pool area because of the cost. We retired last year and would love to cut our cost back. Also with eight of us the units away from the pool have the balconies which would extend our living space. Great property with the perfect location. Always very friendly and helpful. I enjoy working with your team each year. Really enjoy staying at the Harbours. We love that it is so close to town, beautiful views of the sunset, lake, and all the activity on the beach. The pool is a bonus. We met the Miller family from Zionsville 4 years ago and just love them. We now book the same week so we can be there together. Most of the property owners are very nice and enforce the rules by telling us if we are doing something wrong but this year a few were not so pleasant. I guess that is going to happen when they have several visitors renting the condos week after week. Excellent team and very accommodating. My family had a wonderful week at the Condo in Harbors. Look forward to next year. We would like to allow the Russ & Linda Jenkins family the opportunity to stay in 36 next year and we would like to check out your other Harbours condos - we love the location but need something less expensive. #17 looks nice and roomy - what others do you have available? Love your professionalism and timely responses to all of our questions. Loved stay at the Cannery because of the friendly owners and because of the proximity to the pool for the delight of your grandchildren.